1969 was a benchmark year in United States history with Neil Armstrong becoming the first person to step foot on the moon as a product of American engineering and innovation. 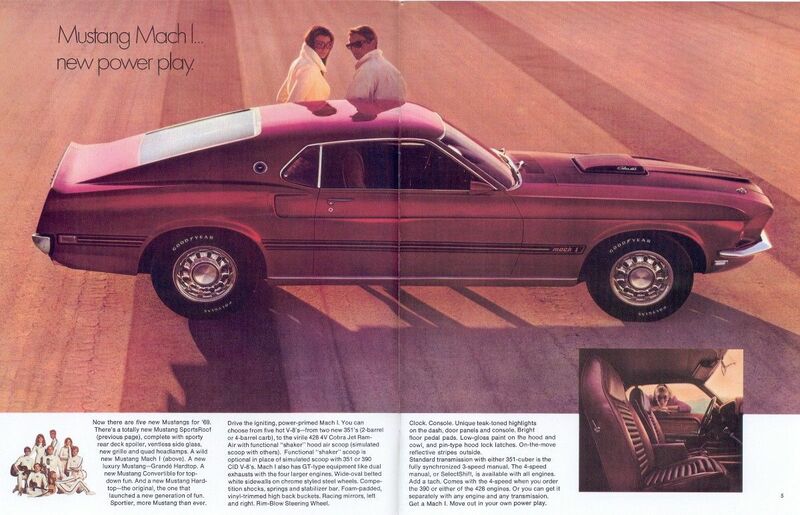 The Mach 1 Super Cobra Jet Mustang was about as iconic as it gets in the automotive industry at the time. Made specifically for drag racing and competing against the Chevrolet Camaro. This is a well-documented, beautiful Mach 1 428 Cobra Jet with the drag pack and ram air option. This particular Mach 1 has lived a good life and has underwent a total restoration in 2001. The suspension has all been rebuilt to OE specs, the 428CJ engine has been rebuilt using all 1969 NOS or era correct parts and the paint shines like you wouldn't believe. Being a true time capsule to 1969 with the original AM radio, interior design/color, engine specs, exhaust, wheels/tires and styling. You would be hard pressed to find another one in this good of shape. Ford officially offered a pair of 428 Cobra Jets: the Q-code standard-issue (non-ram-air) and the Ram Air R-code. Both had 10.6:1 compression. Both were rated at 335 horsepower. Other than the notion that the Q-code retained the dummy scoop and the R-code used a genuine Shaker, these engines were essentially the same. The 428CJ was treated to a set of deep-breathing heads from the 427 (2.09/1.65-inch valves, combustion chamber volumes between 73 and 75 cc, larger intake and exhaust ports, 427 valve springs and dampers), a 735-cfm Holley four-barrel carb, and freer-breathing exhaust manifolds, along with beefier connecting rods. The 428CJ's actual power output is reputed to be well north of 400 hp, with its advertised numbers artificially lowered to help keep the insurance companies from jacking up its rates. Car and Driver tested a 1969 428CJ-powered Mach 1, and by doing back-to-back runs with the scoop both taped shut and unimpeded, they discovered that the extra rush of air was worth two-tenths and about 2 MPH in the quarter-mile. Ford offered it's top of the line, legendary Toploader four-speed, with close-ratio and wide-ratio gearsets on most models. All of the Toploader four-speeds of the era have a model number starting with the "RUG" prefix. The alphanumeric suffix changed depending on engine and gearsets. The wide-ratio four-speed gear ratios are as follows: 2.78/1.93/1.36/1.00, with 2.78 reverse gear. The wide-ratio four-speed was not available on 428 models. Close-ratio four-speed gear ratios are as follows: 2.32/1.69/1.29/1.00, with 2.32 reverse gear. All Mach 1 Mustangs came with Ford's tough 9-inch ring-and-pinion; a limited-slip differential, called Traction-Lok in Ford speak, was optional. An open 3.00 axle (code 6) was standard; with Traction-Lok, it's code O (that's letter O, not "zero"). An open 3.25:1 was code 9, while a Traction-Lok 3.25:1 wore code R. Open 3.50s were stamped with code A, while Traction-Lok 3.50:1 models wore code S. Code V signifies 3.91 with Traction-Lok, while a "W" means 4.30 with Traction-Lok. Ordering the V- and W-code gears are what got you the beefed-up internals of a 428SCJ engine. The 1969 Mach 1 added low-gloss hood paint on the cowl and hood, a sporting touch to prevent sun reflections; reflective side stripes and tail stripe; specific rocker moldings; pin-type hood lock latches; a pop-open gas cap; swing-out rear quarter windows; dual color-keyed sport mirrors; and tinted rear glass. Window louvers and front and rear spoilers were popular dealer add-ons that were unavailable until the Boss 302 came out mid-1969. They were not factory-installed. Mach 1 interiors consisted of high-back buckets with knitted vinyl, carpeting with integral red vinyl heel pads, console, wood-finish Rim-Blow steering wheel, clock, bright pedal pads, molded door panels with integral arm rests and safety/courtesy lights, Mach 1-specific teak-toned highlights on dash, console and door panels, and a special insulation package that added a whopping 55 pounds to the car. A tachometer was optional with all available engines. The 1969 Mustang interior color palette included an even dozen shades: white, two shades of black, four shades of blue, three shades of gold, plus dark red and a dark green.